What Is a Degenerative Spine Condition - Disease - Disorder? HomeSpecific DiagnosesDegenerative Spine ConditionsWhat Is a Degenerative Spine Condition – Disease – Disorder? I went to the Internet for help with this and found a great, easy piece that lays out several types of degenerative spine conditions altogether. You may have just one, or many like I do. Spinal osteoarthritis. Also referred to as degenerative spinal arthritis, this condition involves the breakdown of cartilage located on the spinal facet joints. When osteoarthritis occurs, cartilage wears away, allowing bone-on-bone contact to occur within the joint. This can cause inflammation, the formation of bone spurs and nerve irritation. Degenerative disc disease. This condition describes the breakdown of intervertebral discs. When we grow older, the intervertebral discs dehydrate and the proteins that keep them healthy break down. As the discs deteriorate, they become less effective at supporting the vertebrae. This can cause the vertebrae to become slightly displaced and put pressure on the nerve roots that travel in between the vertebrae, or press on the spinal cord itself. Bulging discs. A bulging disc refers to an intervertebral disc that has swelled beyond its normal parameters between adjacent vertebral bodies. The enlarged disc remains structurally intact but due to increased pressure, has expanded into the spinal column. A bulging disc is not inherently symptomatic, but when the disc wall comes in contact with the spinal cord or any nearby nerve infrastructure, painful symptoms can develop. Herniated discs. 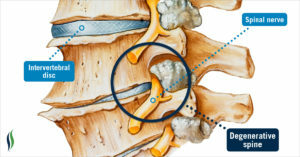 A herniated disc refers to an intervertebral disc that has ruptured, allowing the inner gel-like disc material to seep into the spinal canal through a tear in the disc wall. This condition can be painful if the nerves that innervate the disc become irritated as a result of the rupture or if the extruded disc material irritates the spinal nerves. Herniated discs might develop as a result of an injury, but can also be caused by disc weakening that comes with age. Spondylolisthesis. Spondylolisthesis is a condition indicated by the presence of vertebral misalignment. In an otherwise healthy spine, the spinal column has a natural “S”-curve that evenly distributes weight along its length. With spondylolisthesis, one of the vertebral bodies in the spinal column slides out of its normal position. This condition is described in degrees of severity, with Grade 1 spondylolisthesis representing 0 to 25 percent slippage and Grade 4 spondylolisthesis indicating 75 to 100 percent vertebral slippage. Degenerative scoliosis. While most people equate scoliosis with adolescence, degenerative scoliosis is a spine condition that can develop later in life. When scoliosis occurs, it causes a side-to-side curvature of the spine, which can result in symptoms including a hunched posture or a change in gait. Bone spurs. Bone spurs are smooth protrusions of excess bone that frequently accompany arthritic deterioration. While these growths of bone are asymptomatic in and of themselves, the excess material can become problematic if it comes in contact with a nearby nerve. Bone spurs also often form in the aftermath of an injury. Spinal stenosis. Spinal stenosis describes the narrowing of the spinal canal. This isn’t necessarily problematic by itself, but when the canal space becomes constricted, the spinal cord and other nerve structures can be irritated. Common causes of spinal stenosis include the presence of herniated disc material, bone spurs and other tissue. Foraminal stenosis. Foraminal stenosis describes the narrowing of the passageways through which nerve roots enter and exit the spinal canal. Like spinal stenosis, this condition isn’t symptomatic by itself, but if the space becomes so narrowed that the nerves are irritated, a variety of painful symptoms may develop. Often, this condition causes discomfort to travel the length of the affected nerve, potentially causing pain to develop in areas seemingly unrelated to the spine. Pinched nerves. A pinched spinal nerve is a common condition that most people will experience on occasion, as they grow older. When the symptoms of a pinched nerve don’t go away on their own over several days, they could be the byproduct of one of the aforementioned degenerative spine conditions. Alleviating the symptoms is contingent on identifying and addressing the cause of the nerve constriction. Sciatica. Sciatica is a term that is frequently used as a catchall to describe the symptoms that arise from the inflammation and irritation of the sciatic nerve. This nerve originates at the base of the spinal cord and extends downward through the lower body before ending near the feet. Most commonly, sciatica is associated with chronic lower back and leg pain.